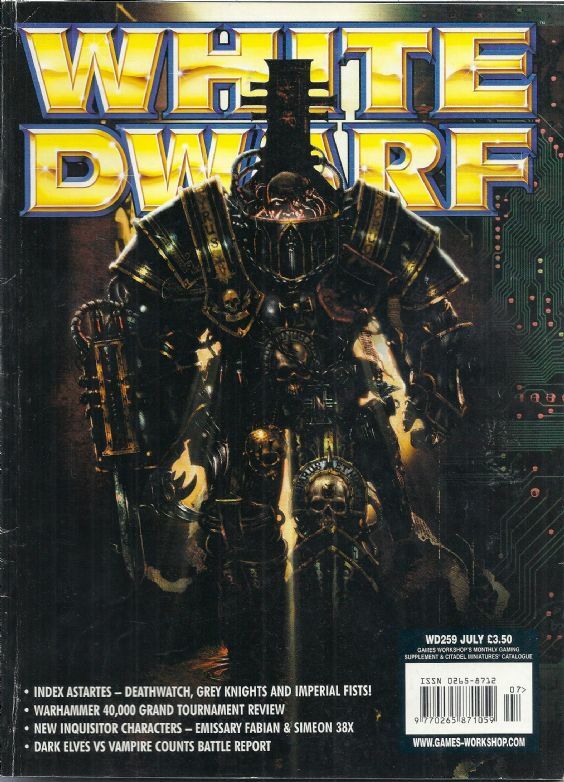 Way back in 2001 while Westlife, Shaggy and Geri Halliwell were making horrible broadcasting sounds and Playstation 1 fans eagerly awaited the upcoming Tomb Raider movie, I brought my Sin-Eaters chaos space marine army to a UK Warhammer 40,000 Grand Tournament. The event took place in Games Workshop HQ that February. 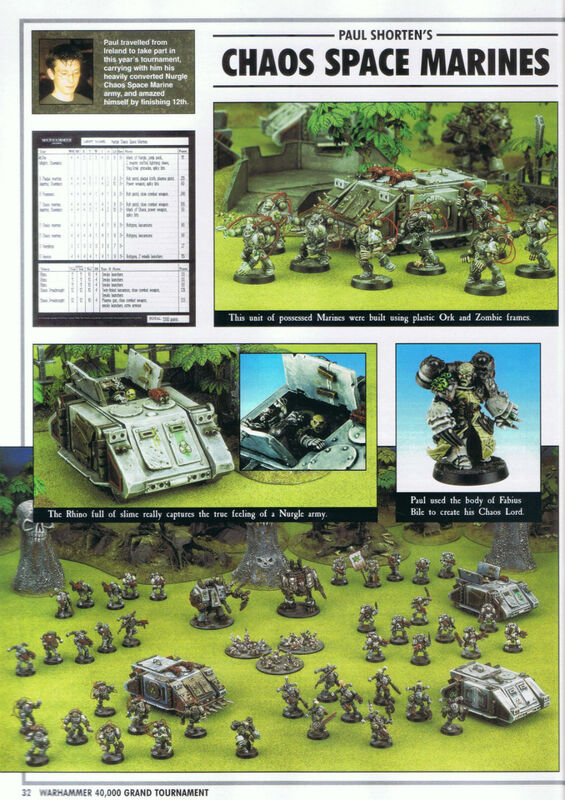 The staff there liked my army, took some photos of it and printed them in White Dwarf #259 the following July. The APC that became known as “jacuzzi rhino”. 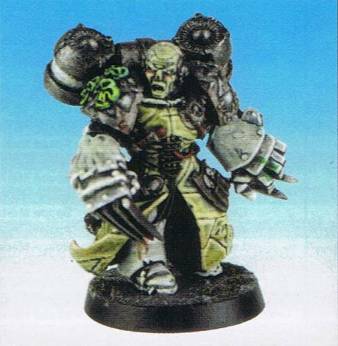 Having pored over pictures of painted models in White Dwarf magazine for the previous decade or so, I got a kick out of having my models feature in it. I learned to paint toy soldiers from reading the various ‘Eavy Metal articles in the magazine during my teens, so it was satisfying to make the grade myself on some level. Chaos Lord Eddie. The definition of a suicidal, one-shot weapon. I dont paint my miniatures to anything like display standard and I will never have the patience required to paint figures to the level required by something like Golden Demon. 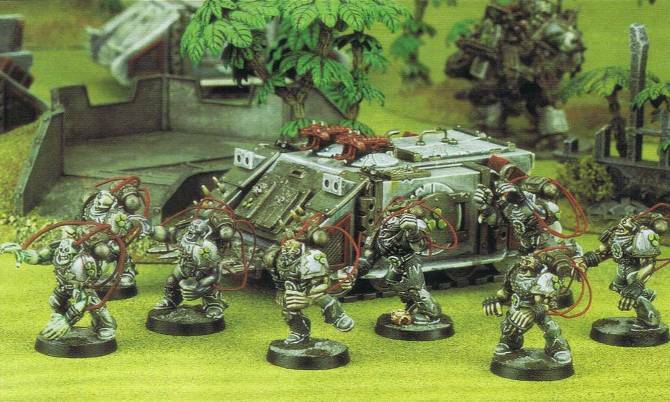 I do paint to a pretty decent tabletop standard though, so an army sized project was likely the only way that my little guys would ever have shown up in the magazine. So it was fun when they did. Sin Eaters Possessed cavort in front of familiar White Dwarf terrain of the era. I had more Sin-Eater miniatures painted at the time than shown in the photo and I added a lot more subsequently. I have taken a few, mainly quite poor photos of some of the units over the years but I plan to spend a day photographing the army in detail at some point. Although there are obviously a few things that I would do differently with the army if I were to work on it now, I am still quite happy with the Sin-Eaters overall. They were pretty labour intensive to assemble, convert and paint however and I am certain that I will never take on a project as large and involved as that again. These days I find prepping and painting smaller projects much more satisfying and achievable. Sin Eaters at the UKGT, 2001. The army shot above looks oddly quaint now. Modern 40K tournament armies are significantly larger than the one above. At the time of writing the current preference seems to be for large numbers of big flying models: quite different from the rhino rush picture shown. Click the image to see a pretty large scan of the page. The Sin Eaters still look great, and I think the size of the force is quite sufficient. The Apocalypse-sized armies GW is pushing now are certainly beyond my scope in both time and money. Necromunda gangs, Mordheim bands and Gorkamorka mobs are more my speed, so just painting an army of this size is a challenge. A similar-sized Tau force will make for a great project for you. I regard myself as someone who takes the hobby pretty seriously and who also has sufficient free time outside of work to give it a fair shot. Even so, the idea of putting together an army sized project is extremely daunting and something that I dont think that I will ever do again. Its not worth the time and effort. Like you I now prefer skirmish sized forces. Its a lot easier to stay focused and actually complete a project when there are fewer than twenty guys to paint up. Obviously assuming that the price was right one could paint a larger amount of figures to a poorer standard, but the sweet spot for the painting quality that keeps me interested versus time is somewhere between five and twenty figures.